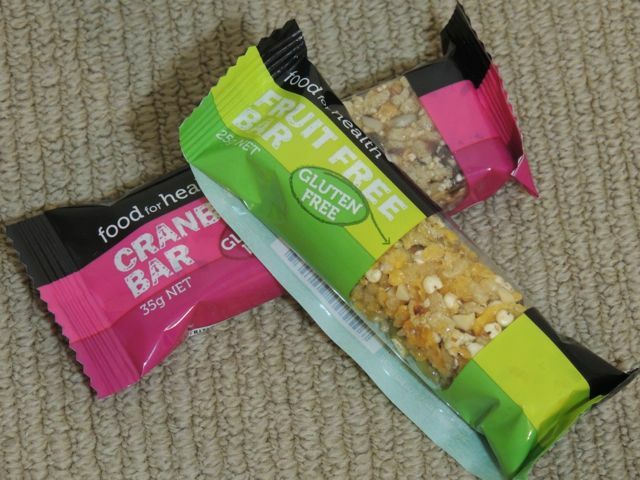 My emergency healthy bar stash was close to diminishing, I was now down to my last two bars, one of which I ate for breakfast. Today was our most intensive cardiovascular workout in Rome by far as we were going on a tour inside the smallest country in the world, the Vatican!! Can you believe the Vatican is actually classed as it’s own country with a population of 770 people!! 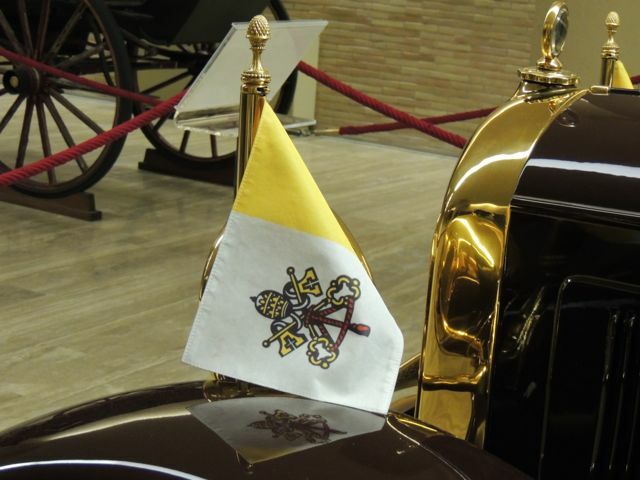 However none of these people are actually permanent residents… I found this information so interesting, especially the fact that the Vatican has it’s own flag!! We were lucky to be on the tour with a passionate historian who was extremely passionate and knowledgeable on everything relating to the Vatican… I was excited as our tour included a visit to the Sistine Chapel where Michaelangelo painted frescoes on the ceiling with the most recognised being “The Creation of Adam”. St Peter’s Basilica is located in the grounds of the Vatican which is actually the burial site of Saint Peter who was one of Jesus’s twelve apostles. We were recommended by our guide to go up the top of St Peter’s Basilica where we could witness a 360 degree aerial view of the Vatican. 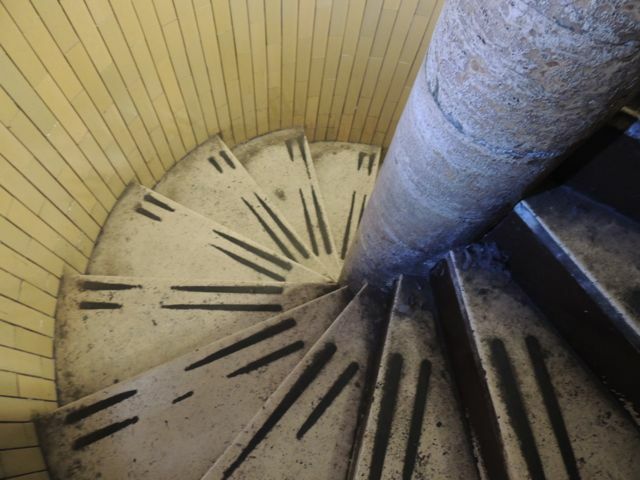 What she failed to tell us was there were 551 stairs to get there. I had no problem with the stairs in fact I was EXCITED!!! The Fiance (Sean) and our friends on the other hand opted for the lift, HOWEVER the lift only went half way and there was no choice but to burn some quirky calories by climbling the remaining 320 stairs to get to the top. It was actually quite scary as the stairs were very steep and quite tight in some places and I tripped up the stairs twice!! 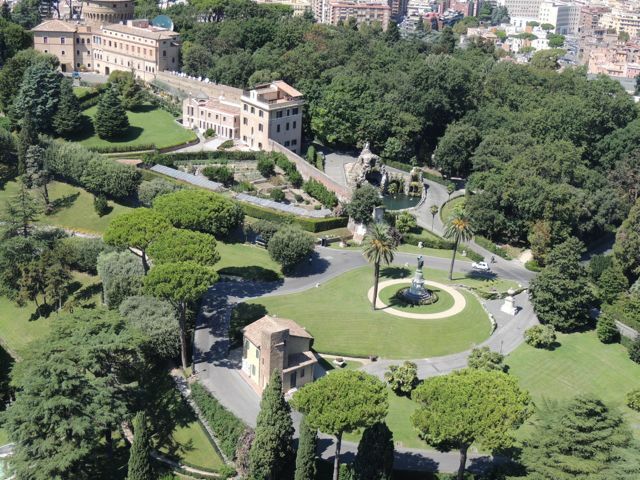 The view of the Vatican from the top was beautiful, lovely manicured lawns, I even saw a mini waterfall!! There was no time for lunch as our next stop was an art museum that we was pre-booked, I was famished!! Sean bought me a panini but the bread was way too hard for my liking so I did what one should never do and skipped lunch which is EXTREMELY bad…. Skipping meals actually slows down our metabolism but most importantly is the affect that skipping a meal has on our blood sugar. You see when a meal is skipped our blood sugar drops dramatically which can result in us feeling tired and sluggish and can also wreck havoc with the insulin in our body. Studies have proven that if in extreme cases, if meals are chronically skipped this can lead to developing diabetes later on in life. 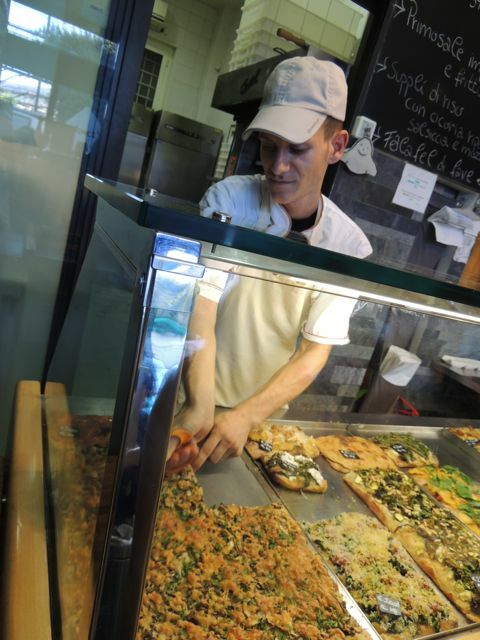 Next stop was a Pizza cafe that was noted in a so called food blog… The pizza looked quite fresh with quirky toppings!! The process was to chose the flavour you wanted and this was cut with scissors, weighed, priced and heated up for you!! We ordered the fig pizza which actually had blue cheese on it, I was not a fan as I don’t like blue cheese however I was not familiar of this cheese type before ordering. 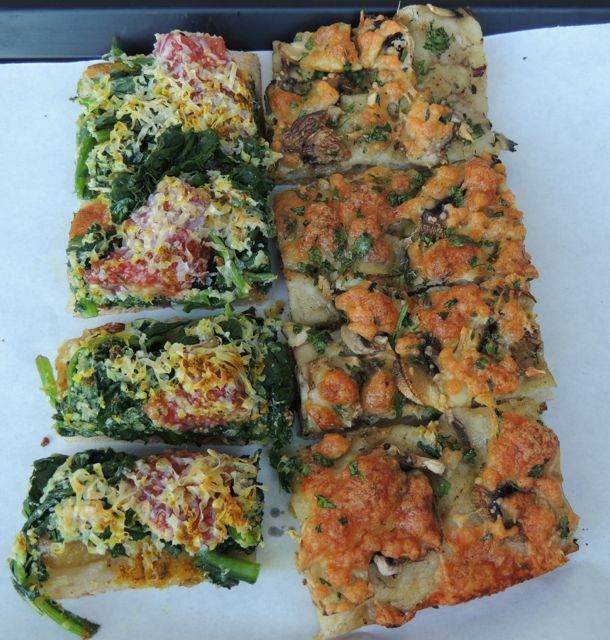 The second was a mushroom pizza which again was not the best I had tasted but also not the worst. 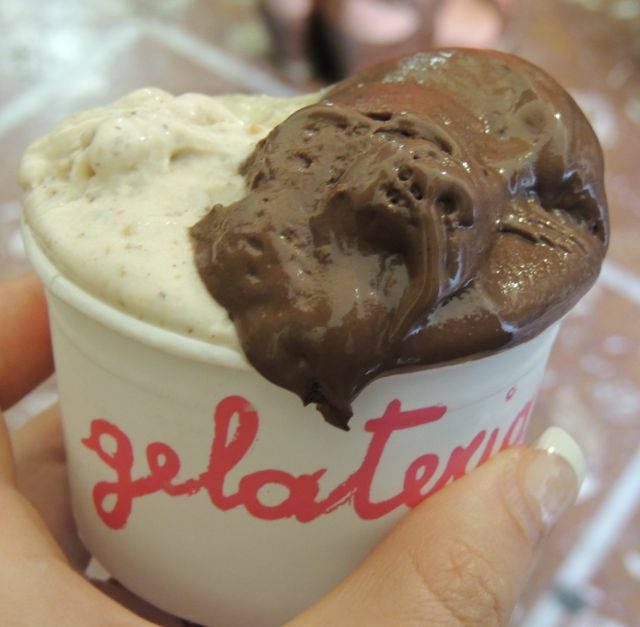 What to do after a pizza binge.. Hmmmm, a gelato binge of course!! Sean and I make a habit of sampling 1 scoop of hazelnut and 1 scoop of pistachio gelato at any gelaterie we visit, this allows us to make a proper comparisson and identify the good, the bad and the ugly!! On this occasion I went outside the square and actually got chocolate opposed to pistachio, it was okay but would I order it again? I am not so sure. I was so happy with the good deed I did tonight….. Now remember yesterday when when I was trying to order the healthy option (as I always do) and ordered the vegetarian pizza that was covered in so much cheese but little vegetables, WELL we actually got take away as I couldn’t eat it as it was way too cheesy for me so tonight I told Sean I would take it and give it to the first homeless person I saw (as sadly there are many people living on the street in Rome). Sean thought this was a ridiculous idea and the homeless person would be offended to be given left overs BUT I went out with my handbag in one hand and left over pizza in the other…. We walked a few blocks BUT no homeless people, what the heck was going on?? This was the first night a homeless person had asked me for money.. Hmmm was I going to have to walk around with this left over pizza all night?? Sean told me just to throw it away but I remembered the saying “waste not want not” my mother use to tell me and just before we reached our restaurant, sure enough there was a man on a rug with his little cup out asking for money, I asked if he wanted pizza and sure enough he said yes!! He was so happy and my good deed left me feeling like a million dollars. While the homeless man was enjoying his cheesy carbohydrate treat we arrived at the restauarant and I had a relatively healthy dinner. I was excited to see greens on the menu so this was definitely. 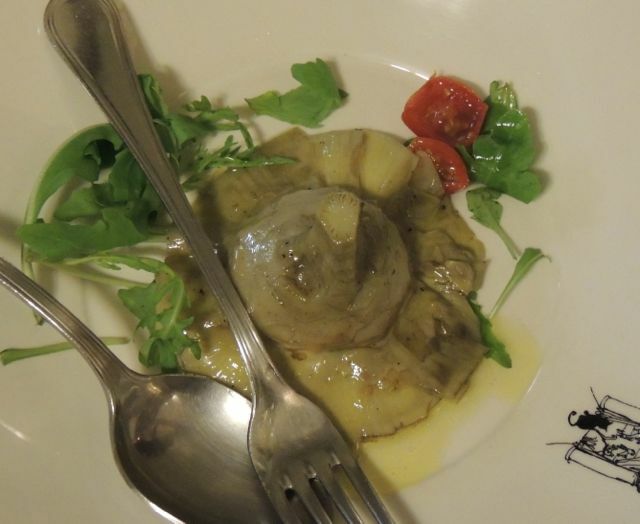 As there were six of us we ordered a variety of entree’s to share, another quirky yet healthy appetiser was artichoke, so yummy!! 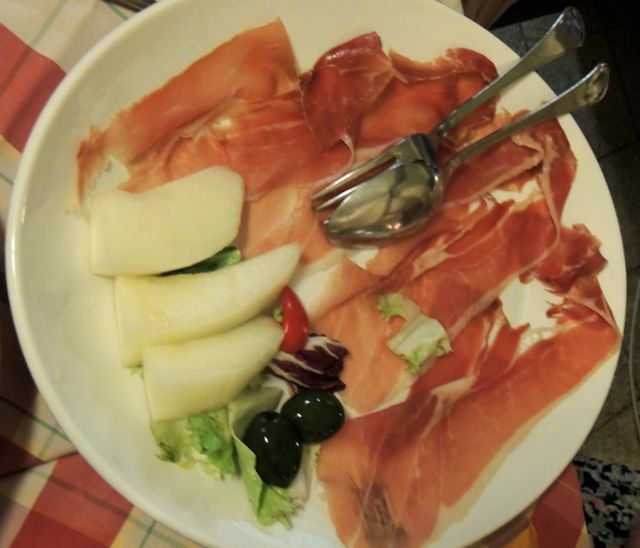 I could not go past my favourite prosciutto with melon dish, so tasty and the melon was healthy and divine!! 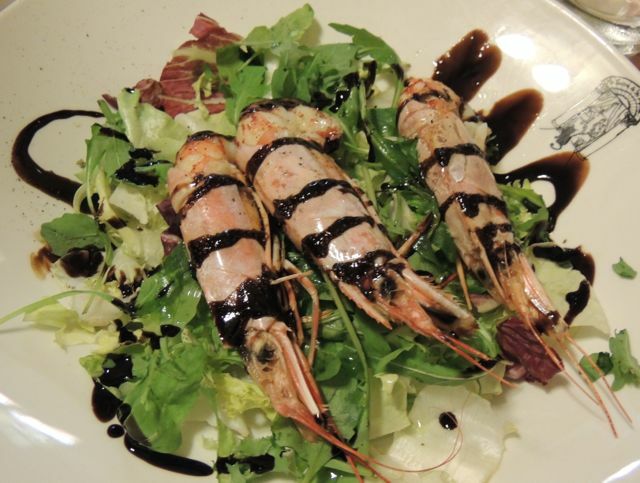 Yummy healthy prawns which are very low in calories!! Did you know that prawns contain nearly 22 times the amount of vitamin E that is found in beef and 19 times that of chicken. 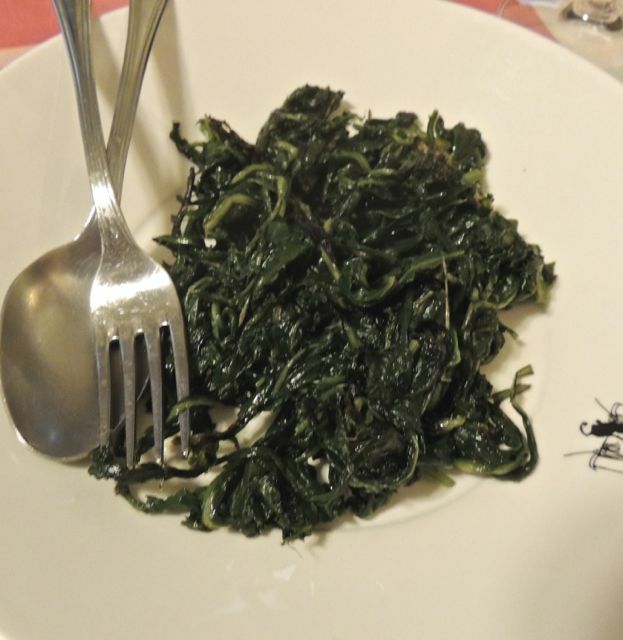 Prawns are also rich in Omega-3 which is a fat found in oil rich seafood of which the body is unable to produce, therefore a dietary supplement is essential. There are many benefits of Omega-3, it can help to protect the heart and studies have been done advising it can reduce the development of some types of cancers. So far on my Quirky adventure I have really tried to make healthy food choices but a lot of the time these have backfired on me, like take the vegetarian pizza for instance. 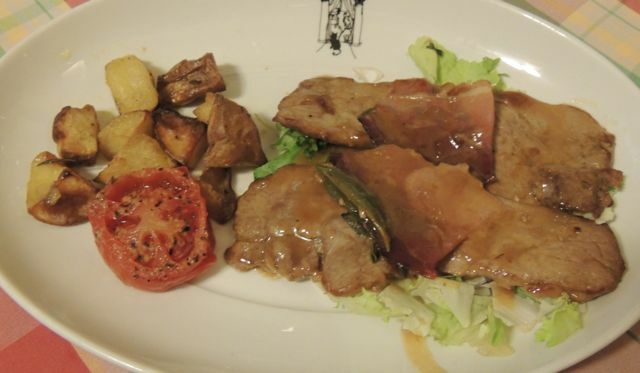 Tonight when I ordered the veal saltimbocca, it was another backfire, gggrrrhhh!!!! My loyalty to Masterchef has taught me many things, one of which is how to cook veal saltimbocca, I assumed being in Italy the dish would be an enhancement to the delicious dish I witnessed on television but alas the dish was far from what I envisioned. It was terribly SALTy which is not what SALTimbocca is named for, sadly I could not eat it but shared bits and pieces of pasta dishes that my food tribe had ordered around the table. 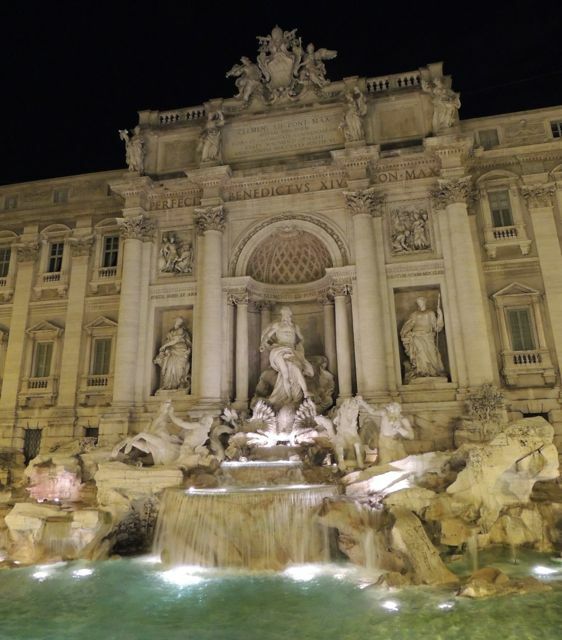 The others had retired for the evening when Sean so Sean and I decided to get one more cardio adventure in and I visited Trevi Fountain before retiring for the evening!!! I is a gorgeous must see in Rome.